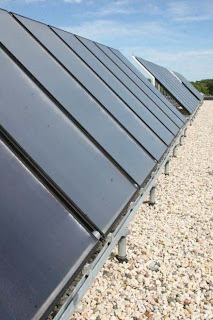 The solar water heating systems serve Fort Atkinson high school and the middle school. The radiant energy striking the rooftop panels year-round is efficiently collected and taken inside to preheat the swimming pools inside each structure. Except during the winter months, the incoming solar energy is sufficient to maintain pool temperatures at 84°F. Even in January, however, the savings that a solar hot water system yields simply by preheating a pool to 70°F is substantial when multiplied over several decades. As a result of educating themselves on the connection between energy use and atmospheric pollution, several school districts in Wisconsin are taking increasingly aggressive steps to conserve energy as well as produce a portion of what they use on-site. Some have embraced ground source heat pump systems (Fond du Lac High School), while others have installed solar hot water systems (Osceola Middle School) and solar electric systems (Paul Olson elementary school in Madison). Not to be outdone, Wausau East High School recently installed a 100 kW Northwind turbine, which is now the largest wind generator attached to a school building in Wisconsin. Yet if one measures success by substantial reductions in energy expenditures and emissions reductions, there is one school district in Wisconsin that stands head and shoulders above its peers: Fort Atkinson. Serving 2,700 school-age children in a community of 12,000, the Fort Atkinson School District operates six buildings: four elementary schools, one middle school and a high school. School officials have made no secret of their aspiration to make Fort Atkinson the most energy-efficient and self-sufficient K-12 district in the state. + Install on-site renewable production at all six schools. Virtually every renewable energy technology or efficiency measure available to a Wisconsin K-12 district has already been or is about to be deployed somewhere in Fort Atkinson. This lengthy list includes ground source heat pumps, solar hot water systems, lighting retrofits, tankless water heaters, retro-commissioning, occupancy sensors, window replacement, and roof insulation. The most recent system to be installed, a 50 kilowatt wind turbine at the high school, will be operational by Christmas 2009. The integrated approach pursued by Fort Atkinson leads to lower operating expenses, which in turn frees up capital for renewable technologies that have higher up-front costs but will deliver energy to the school buildings long after the initial investment is paid off. At the same time, converting sunlight and wind into useful energy sources enable building owners to reduce the variability of their utility costs. For a school district, that means not having to worry about the effect of a colder-than-normal winter on next year’s budget for textbooks. The solar water heating systems serving the high school and the middle school neatly illustrate this benefit. The radiant energy striking the rooftop panels year-round is efficiently collected and taken inside to preheat the swimming pools inside each structure. Except during the winter months, the incoming solar energy is sufficient to maintain pool temperatures at 84°F. Even in January, however, the savings that a solar hot water system yields simply by preheating a pool to 70°F is substantial when multiplied over several decades. The capital required to heat a swimming pool with solar energy is not trivial. For the 48-panel system atop the high school, the installed cost totaled $198,000, while the 32-panel installation serving the middle school came in at $115,000. Dennis Kuchenmeister, who manages the district’s buildings and grounds, estimates a 5% return on investment (ROI) for the high school’s system and an 11% ROI on the middle school’s system. According to Kuchenmeister, the hot water systems will supply about 60% of the heat going into the pools, displacing the equivalent of nearly 9,000 therms a year. The district expects to save $18,000 in avoided fuel costs per year. Kuchenmeister’s economic estimates factor in incentives from Focus on Energy covering up to 35% of the total installed cost and matching incentives from We Energies, the local utility serving the school district. By taking full advantage of available incentive dollars, the school district was able to reduce the out-of-pocket portion of installation costs by more than 50%. Because the annual harvest of solar energy striking a particular spot rarely fluctuates by more than 10%, a building owner can be reasonably confident of how much conventional energy an installation will displace. In contrast, the cost of heating a pool with natural gas can easily triple during a 12-month period even when usage remains constant. This in fact happened to Fort Atkinson in the 12 months preceding the installation of its two solar hot water systems in the fall of 2008. Thus, the real value of Fort Atkinson’s solar hot water installations is in minimizing the district’s exposure to the price volatility associated with unregulated fossil fuels like natural gas. And while it’s true that natural gas prices are presently at five-year lows, they could easily bounce back to 2008 levels in a year or two, depending on events over which end-users have no control. 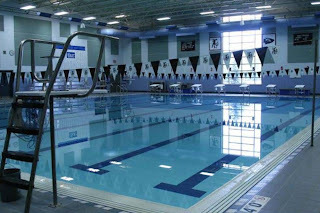 However, by installing a renewable technology that preheats their swimming pools, the Fort Atkinson has effectively insured itself against a repeat appearance of the fossil fuel rollercoaster ride that most school districts would just as soon forget. There are two other reasons why school buildings are well-matched for solar energy installations. First, the buildings themselves are dedicated to a public function that is expected to last for several generations. In such settings it is easier to justify the additional up-fronts costs, especially if the installation also communicates a valuable lesson in sustainability to the entire community. Second, most schools, especially newer ones, have an abundance of flat, unshaded roof space that can support large arrays, irrespective of building orientation. Real-time production data from both installations can be accessed online by visiting www.fatspaniel.net and searching for the live sites listed under We Energies. The district also uses Energy Watchdog, a web-based program provided by Focus on Energy to track energy usage. This program enables Fort Atkinson to document the energy and cost reductions from measures specified in its energy plan. The middle school is also one of four schools in Fort Atkinson equipped with ground source heat pump systems that heat and cool the buildings year-round using the nearly constant temperatures in the ground. These systems heat buildings in the winter and cool them in the summer. Ground source heat pump systems are electrically powered; no heating fuel like natural gas or propane is needed to heat the four schools. “We essentially cut the gas line to our schools,” said Kuchenmeister during a presentation on his district’s sustainable energy initiative last November in Milwaukee. The operational costs of ground source heat pumps are substantially lower than the HVAC systems they replace. As a result of their renovation, the three elementary schools have seen their energy intensity drop by more than one-half, even though they now have air-conditioning in the classrooms. School officials estimate that all four ground source heat pump systems will save the district $30,000 annually in fuel costs. As with solar hot water systems, Focus on Energy provides incentives for ground source heat pumps to schools, businesses and residences. The program awarded more than $96,000 towards the four systems installed in Fort Atkinson. According to a Focus on Energy fact sheet, “a ground source heat pump system is arguably the most efficient technology for heating and cooling Wisconsin homes and businesses.” Given its embrace of that technology and others deployed in its buildings, Fort Atkinson has become, in terms of energy sustainability, arguably the most forward-thinking school district in the state.